The world’s most iconic beer has added even more appeal to its name! 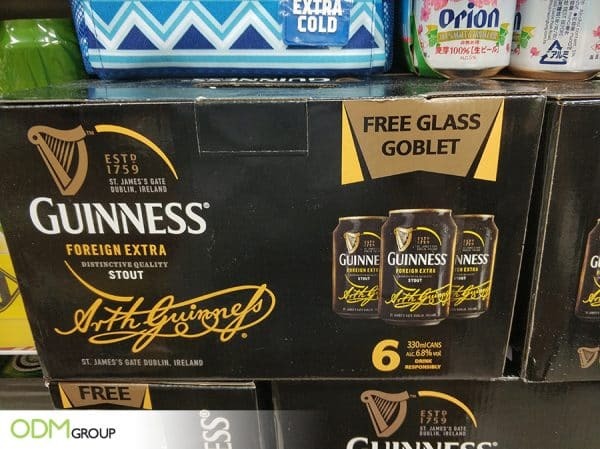 Guinness has cleverly included a free glass with purchase of its 6 x 330ml beer crate. This is a great strategy to market its brand and increase sales of its product – this is a perfect example of how a gift with purchase can take your company to the next level! Drinks Promo gift ideas are likely to increase sales. 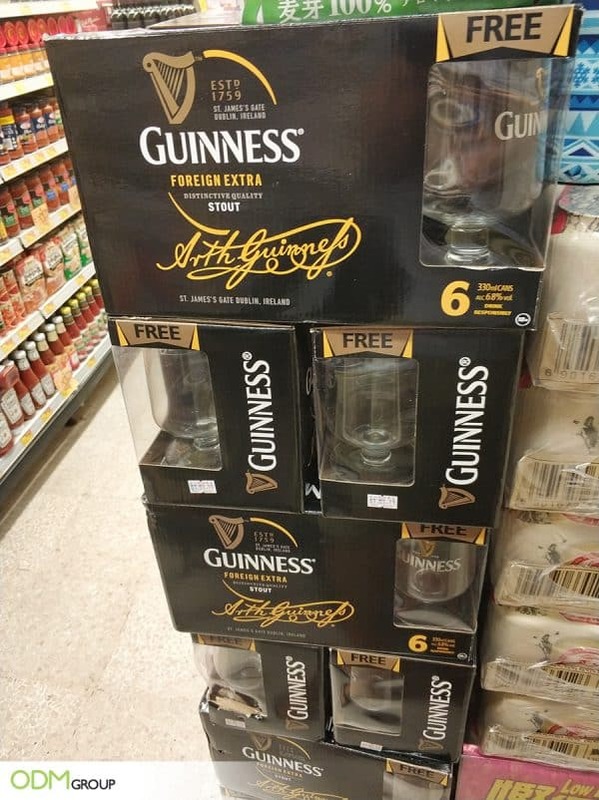 Even though the customer may not intend on buying 6 cans of Guinness, with a free gift they are much more likely to spend a bit more knowing they are receiving something in return. Furthermore, drinking the beer out of the branded glass will increase the Guinness brand marketing. Whether it’s St Patrick’s Day, your Irish friend is in town or you fancy a glass of Guinness on a Friday evening; this is certainly the perfect way to use a free glass with purchase to enhance your company’s branding. This becomes even more beneficial for your company during sports seasons such as the Rugby Six Nations or FIFA World Cup season – the free glass with purchase can become part of a sports promo water bottle. – Brand Exposure: Enhancing your brand exposure beyond the shop floor. Glasses, an everyday use item, are a great way of expanding your brand name. – The glass compliments your own item (if beverage company). What better way to enjoy your beverage than out of a customized branded glass? – Boost your Sales: If customers are getting something for free, they are more likely to purchase your product. This is particularly effective if you set a minimum purchase for the gift redemption, meaning customers would buy more of your product than they necessarily would if there wasn’t a free gift. – Customer loyalty: your customers will feel a sense of loyalty if you provide them with a complimentary product from time to time. They will feel like they are getting something more than the product itself when purchasing from your company. This will increase their satisfaction and consequently their loyalty to your brand. 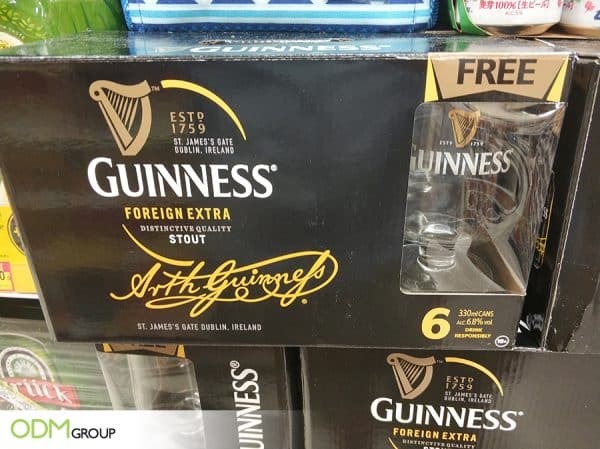 – For St Patrick’s Day in May 2015, Guinness provided a redemption gift for customers who bought 4 crates of their brew. The Mahjong Set redemption gift was a great way to impress customers in China with their brand adaptability. – In Singapore, Guinness ditched the traditional paper advertising for a high-tech video advertising display. The virtual advertisement not only got people talking but also made customers engage more with the product. At ODM, we have significant experience in design and manufacturing. If you are looking to start a drinks promotion and make your own free glass with purchase, then please get in touch with us today! Carlsberg follows Guinness’s footsteps, but which actually grabs the customers’ taste? We’ve got the glass, now we need the bottle opener!